Spooky gingerbread zombie mummies, perfect for decorating with the kids at Halloween. In a food processor bowl place the flour, bicarbonate of soda, ginger, cinnamon and butter. Blend everything until the mix resembles breadcrumbs, then stir through the sugar. In a small bowl lightly whisk the egg and golden syrup together with a fork and then add to the food processor. Pulse until it starts to form a dough. Knead the dough very briefly until smooth, then wrap in clingfilm and allow the dough to rest in the fridge for 10-15 minutes or so. Line two baking trays with greaseproof paper and preheat the oven to 180c/160cfan/350f/gas mark 4. On a lightly floured surface roll out the dough until it’s approximately the thickness of a £1 coin. Using cutters cut out the gingerbread men and place onto the baking trays – make sure you leave a small gap so they can expand whilst cooking. Bake for 12-15 minutes or until lovely golden brown. Let them cool on the baking tray for 10 minutes or so and then move them onto a cooling rack. 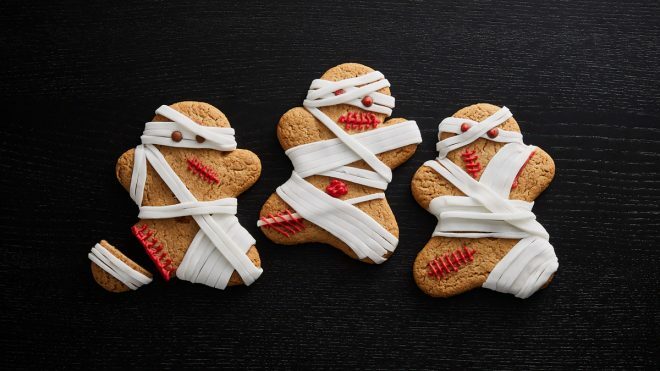 Once cold, roll out the fondant icing, cut into strips and decorate the gingerbread as zombie mummies! Add detail with the writing icing – you can also use it as ‘glue’ for the fondant strips. Feel free to buy shop made gingerbread if you’re short on time so you can decorate them with the kids at Halloween!